For marking MOB location, the man overboard pole has served racing and cruising crew for decades. ISAF World Sailing Offshore Special Regulations [OSR § 4.22.2] requires a MOB pole with flag on offshore racing yachts. The new dan buoy improves on the traditional MOB pole. The dan buoy meets ISAF requirements. US Sailing USSERs state that the dan buoy meets its requirements too. Marine chandleries stock MOB poles for cruising and racing sailors. An MOB pole is not as commonly carried on powerboats. Traditional overboard pole designs have been hard to stow, awkward to mount or use. The dan buoy solves these problems. Below, we compare and contrast the new dan buoy to the old MOB pole to help you reach your own decision. Among powerboaters, there seems to be misperception that prompt throttle response eliminates the need to promptly mark a person’s fall overboard. With a life on the line, it’s smart to make return and recovery as easy as possible. Do not be complacent. A lone head bobbing in the sun, in the dark, or hidden by wave tops, is hard to see, from whatever type of boat the person fell. Man overboard statistics are surprising. They suggest the majority of MOB fatalities occur in conditions people would not consider life-threatening. Serious problems can happen when you least expect. Therefore, be prepared! Practice helps! Technology has advanced in man overboard markers, or lifebuoys. 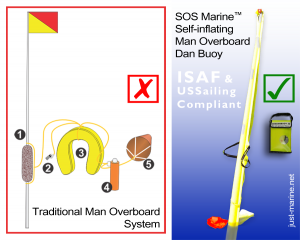 The SOS Marine man overboard dan buoy is so much better than the traditional man overboard pole, it’s time to reconsider the gear you carry for a man overboard event. The self-inflating dan buoy is a new solution to old problems with the man overboard pole on sailboats or powerboats. It not only works better, but is less expensive, too. What Is an M.O.B. Pole? When people talk about MOB poles, they often refer to the complete man overboard buoy system. The pole itself, a type of dan buoy, is usually just the system’s largest part. A ready–to–use system requires other parts as well. Here are the parts of a traditional man overboard buoy system: (numbers correspond to the illustration above). Some boaters will add to that set up a dye marker as well. One problem is that all of these parts are connected by line. Lines tangle, get caught on cleats, get lead through pulpits, get wrapped around other lines. With the traditional MOB pole, there is not just one thing to grab and throw. The man overboard pole itself is usually a fiberglass or bamboo pole with an integral float, a simple buoy. Ballast at the pole’s bottom pulls down against the float to fly a flag at the pole’s top. Not only does the man overboard pole help lead fellow shipmates back to the spot where their crew fell overboard, but also lets boaters on any other boats in the vicinity know there’s a person in the water—please help look for the downed boater—do not inadvertently run over him. It takes many parts to do this job, and each part is another maintenance item. Each piece needs mounting, setting up, stowing, and inspection. The dan buoy is simpler. Cruising boats often carry a man overboard pole alongside the backstay. The pole’s top is often secured with a breakaway flag sock or a PVC tube. A lift–out receptacle often secures the pole bottom. Many racing boats carry a MOB pole in this manner, too. That is awkward for boats with split backstays. For years, racing boats were built with a molded–in transom tube providing horizontal stowage. The man overboard pole would directly deploy from that tube. While convenient, this uses valuable space inside the boat and harbors dirt, mold, etc. It’s hard to keep gear available for use yet not susceptible to theft or inadvertent deployment. Typically, this is another system to rig for each outing, then stow afterward. Because of the pole’s length, when it is not in use, the man overboard pole is awkward to stow. Furthermore, to properly deploy one immediately, some training may be required so as not to foul, or to cope with unfouling, its pieces or connecting lines with pulpit, cleats, and other gear. Using a traditional man overboard pole has not been a simple task of throwing one thing into the water when a crew falls overboard. 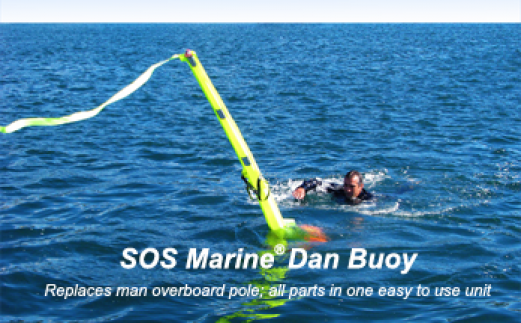 The SOS Marine dan buoy changes that. It is one self–contained unit you Just Throw! For decades, there has been no better solution than the traditional MOB pole thrown to mark the location of a man overboard. Problems with the traditional man overboard buoy system can be divided into categories of expense, maintenance, and ease and speed of use. 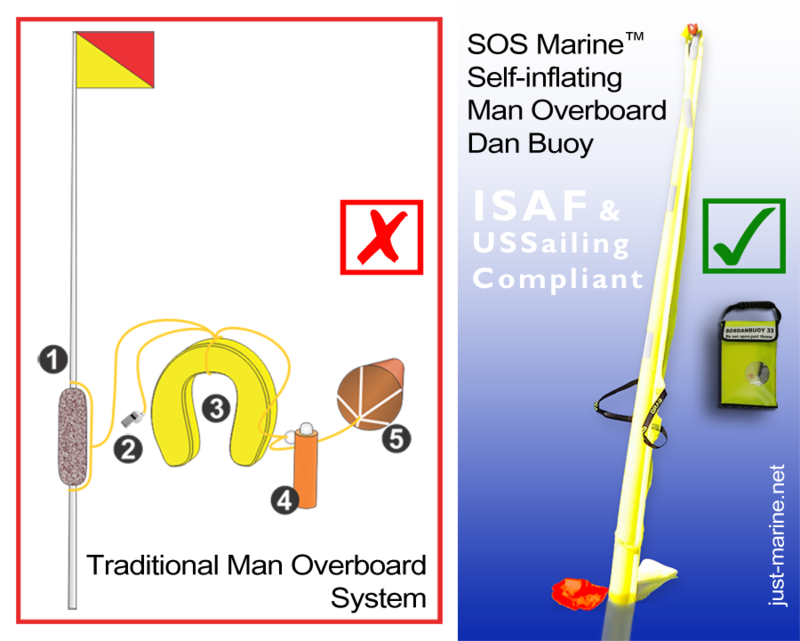 A typical man overboard buoy system is made up of separate parts which are combined to suit. Some of the individual parts are expensive while others are not. Here is a table of competitive prices for COTS components of a traditional man overboard system set up, not including maintenance. If mass-market brackets do not suit your particular application, your installed costs will probably be higher than shown below. A survey of prices of the parts that make up a conventional MOB buoy system. The dan buoy costs less, works better. 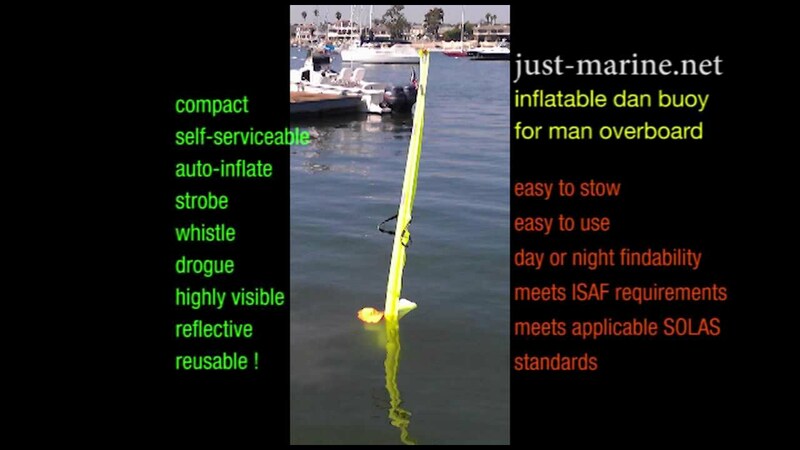 See how the dan buoy compares to man overboard pole alternatives. The traditional MOB pole and accessories necessitate additional maintenance. The pole will need periodic painting, or if left bare, a fiberglass pole can develop glass splinters; the strobe battery must be checked, and to replace is expensive; the horse–collar buoy will need a new cover after a few years; the drogue may become damaged or lost; the flag on the end of the MOB pole and/or the flag sock will need replacement. The dan buoy is recognized by US Sailing and meets ISAF World Sailing requirements. 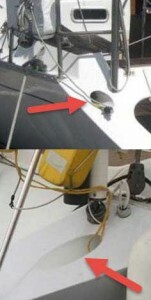 The transom tube for a man overboard pole not only consumes space inside the boat but it harbors dirt, water and mold. Because of its shape, it is also hard to properly clean. If your boat does not already have a built-in MOB pole transom tube, the cost of installing one is high. The individual parts of a man overboard marking system are often connected with pieces of inexpensive polypropylene line. While this line floats, it is susceptible to UV light breakdown. It’s not well–suited to constant outdoor exposure. Old polypropylene line becomes brittle, weakens, develops whiskers, and eventually, these small bits end up all over your boat, or in a hemispherical garbage patch, or they enter the food chain. Replacing polypropylene line constantly used outdoors is a regular maintenance item. Steve Dashew, in his Offshore Cruising Encyclopedia – II (Tucson, AZ: Beowulf, Inc, 2002), p. 237, notes the most important concept in dealing with man overboard is speed of action. For illustration, see the rescue facts section of the dan buoy page. Time is of the essence. Many factors conspire against quick action using traditional MOB pole systems. 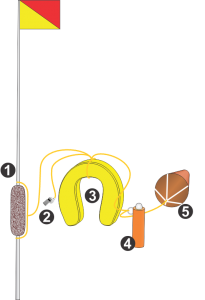 The line connecting the parts can get tangled, wrapped, fouled, tripped over, foul other gear, or foul a propeller. Individual parts of the system can hang up on pulpit, winch, or cleat. When time is of the essence, the SOS Marine dan buoy deploys faster and easier than the traditional man overboard gear we have used for decades. The dan buoy has one handle and no lines to tangle or foul on pulpits or cleats. Training crew to grab the dan buoy by its handle, then Just Throw!, is as easy as it gets. In the 2016 Newport Beach to Ensenada International Yacht Race, the dan buoy saved a sailor’s life! Well, his shipmates did the saving, but they used the dan buoy! Dan buoy easier to use, less to maintain, train, stow. The self–inflating man overboard buoy replaces the traditional man overboard pole and all of its accessories. It brings the pieces together in one easy–to–use unit, easy to carry, easy to throw, and easy to stow. It costs less than the traditional man overboard pole, whistle, buoy, strobe, and drogue setup. It reduces maintenance burden. Almost no set up or stowage after use is required (when you receive yours, just make sure the CO2 cylinder is installed). It requires almost no training to use…Just Throw! It cannot be matched for ease and speed of deployment. These are the reasons knowledgeable sailors see the deployment videos (below) and say, I want one! Make your life simpler (and safer)! 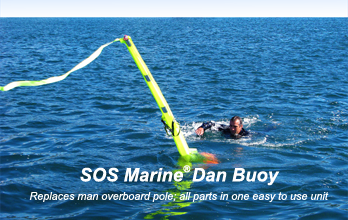 Read more about the dan buoy or buy a dan buoy now! Watch videos of the dan buoy in action. We welcome your comments and questions. Please comment below, or feel free to contact us however you prefer. This entry was posted in Safety at Sea and tagged Man overboard by Philip Thompson. Bookmark the permalink. Philip, I'm up here in Canada sailing the Great Lakes and I have the Dan Buoy and I think it's wonderful. Unfortunately many up here have not grasped the simplicity of the concept yet. They would rather have the big pole and all its parts spending $$$ in maintenance rather than having the Dan Buoy. I imported 2 Dan Buoys (on a special deal) one for me and another to sell and absolutely no one here will buy it. They'd rather spend more money on the old system!!! Thank you Michael for your positive comments. It will just be a matter of time before everyone is comfortable with a new approach to a very old problem. People may not realize that, by the time you add a drogue, a strobe, a whistle, and light reflective tape, to a conventional MOB pole, you will be spending more than the dan buoy, for a solution that is harder to use and less eye–catching. In Australia, where the Dan Buoy was developed and is manufactured, it has become the MOB marker of choice. It has taken a few years to achieve that. When the fax machine came along I'm sure there was resistance, now look where we are with electronic media etc. My website has videos and much information that hopefully should reassure a buyer of the dan buoy's effectiveness. Is their MOB pole built to ISO standards like the Dan Buoy? I recently met a fellow in Oakland who manages boats professionally. He was about to leave on a delivery and thought it worth checking his safety gear. To his surprise the MOB pole went straight to the bottom at the dock. The flotation either came loose or something. LOL.. I still stand by my original comment…… which I see you graciously changed. Glad you see the humor in my adjustments. The Dan Buoy is catching on so I’m sure you will find the right person before too long. The new Dan Hold mount and dan buoy holder is helping sales, it makes the Dan Buoy easy to store in the cockpit area where you can reach and throw in an instant. Try including that in your conversations. Another thing might be to gather a group around and throw it in the harbor to show how fast they deploy and how visible they are. This usually convinces onlookers when I do the same at Safety at Sea seminars. A 33 gram CO2 dan buoy recharge kit from us is inexpensive, or you can purchase one from your local marine store. The investment may well be worth it. I have a question and wonder if you have tested for this. At what true wind speed over the water does the windage of the Dan Buoy cause it to go horizontal and lay flat, or at a severe enough angle to reduce its visibility? In your video with a minimal breeze it looks to be “heeling” a bit to leeward. I do not have actual data to give you. A couple of points though. 1) The wind in the video is stronger than you might be aware. Videos and photos of boats sailing always look lighter and calmer than actual. Not sure why that is. The video is probably around 20 knots. 2) The Dan Buoy bounces back and forth in the swell and wave pattern so it is very eye catching. The ribbon is very visible. 3) The Dan Buoy saved a life 2 years ago at nighttime. It was blowing 20 plus off the Coronado Islands near San Diego. The boat had no problem steering at the strobe light from quite a distance in rough seas after having to get their spinnaker down first. 4) Chuck Hawley, former Chairman of Safety at Sea for US Sailing carries one on his boat. I am happy to talk to you in detail, my # is 714 329 1995.